The University of North Carolina system could be increasing in-state tuition rates in the upcoming school years. North Carolina—like many other states—made significant cuts to education spending during the recession. In response to rising costs, each of the 16 state university campuses has submitted a request to the North Carolina Board of Governors to raise tuition for 2015-16 and 2016-17. 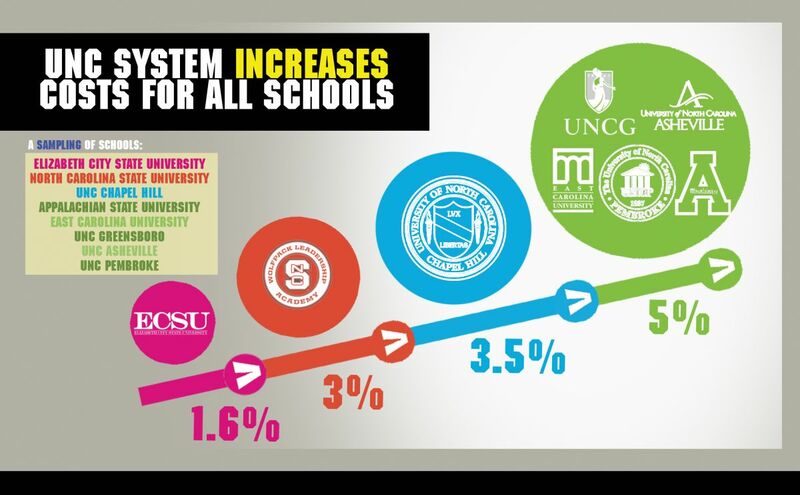 The proposed tuition increases range from a 1.6 percent increase at Elizabeth City State University to a 5 percent increase at East Carolina University, UNC-Greensboro, Appalachian State University, UNC-Pembroke and UNC-Asheville. North Carolina State University and UNC-Chapel Hill would see increases of 3 percent and 3.5 percent, respectively. The N.C. Board of Governors will vote on the proposals in its meeting Feb. 27. North Carolina’s budget cuts have had visible impacts on the N.C. University system. North Carolina is one of just eight states that has yet to restore university funding to pre-recession levels, according to nonpartisan think tank the Center on Budget and Policy Priorities. “No student wants to see tuition increases but at the same time, with decreasing state investment in higher education in the UNC system at some point, the only thing we can do is increase tuition or fees,” said N.C. State student body president Rusty Mau, who received his undergraduate degree last year and is currently pursuing a master's. Mau said it is best to focus on allowing students to have a voice in prioritizing which areas receive the funding from the tuition increase in the coming year, which he sees as inevitable. There are four students on the committee of nine that requests the N.C. State tuition increase, and students at N.C. State have also assembled to discuss the merits of each fee increase for the coming year. UNC-Chapel HIll students have also taken action. Senior Wilson Parker—director of state and external affairs for the school's student government—leads a group of students that meets with state legislators to encourage prioritizing the university system in the budget. Parker adds that affordability is a big topic of discussion around campus. “North Carolina’s universities are a very important part of what our state is today. If you look at the growth North Carolina has had, I think more than any one factor, it’s due to our university system,” Parker said. Both Parker and Mau point out that financial aid policy is interlinked with university tuition policy. If tuition increases, students and families who benefit from financial aid would need to have the support mechanisms in place to bear the burden of the increase. Both students also shared disapproval over the N.C. Board of Governors’ decision to cap the amount of tuition that can be used for need-based aid at 15 percent, a limit which both UNC-Chapel Hill and N.C. State currently exceed. “Tuition increases are really bad, though the recent change to limit the amount of the increase that can go to need-based aid is even worse.” Parker said. The increases are still in the proposal stage, Shirley Ort, associate provost and director of scholarships and student aid at UNC-Chapel Hill, wrote in an email Monday. “We’ll understand more about the potential impact on student aid policy after the February meeting of the BOG,” she wrote.